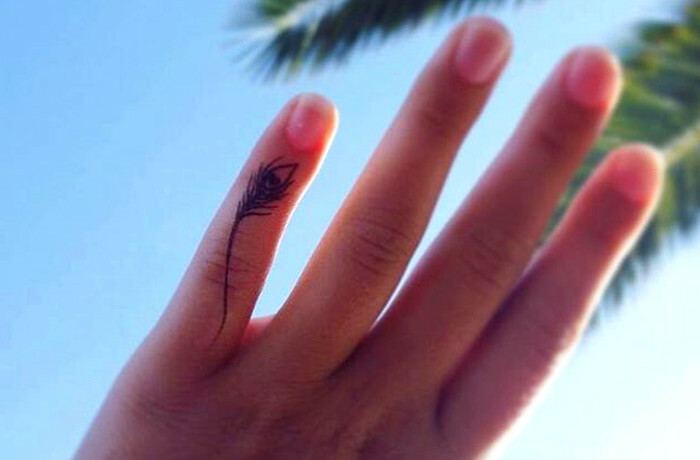 Finger tattoos are a new and recently made popular trend that is taking over. 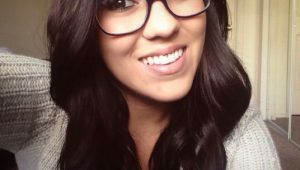 Rihanna was one of the Hollywood celebrities that made the trend popular, and now everyone is following up. 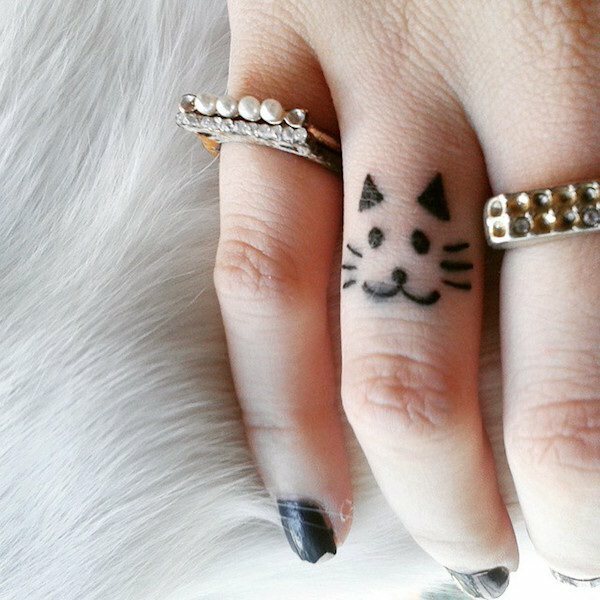 What makes finger tattoos so great? 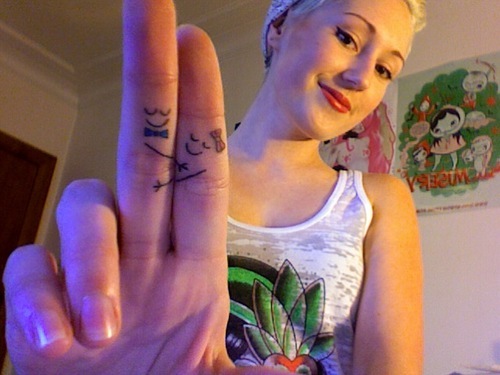 Well, for starters, you can have a finger tattoo no matter if you work in the business sector or not. 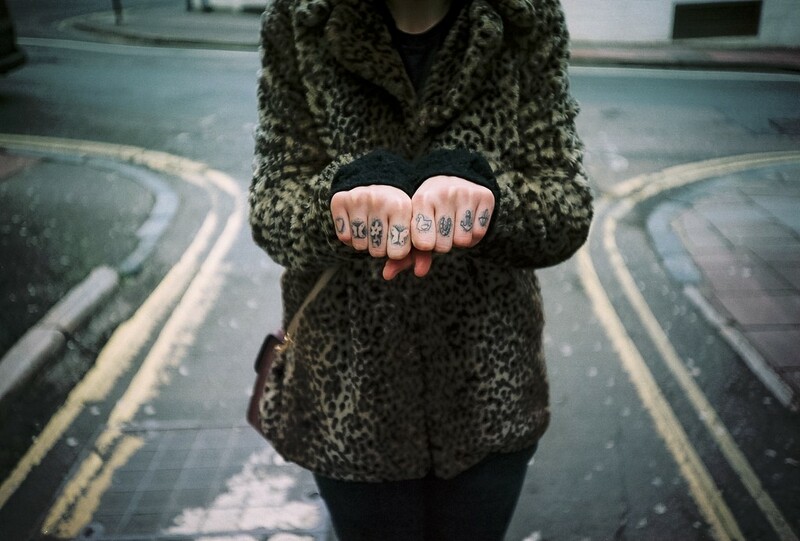 Big tattoos are usually forbidden in the business sector, even though in the U.K. you can find some tattooed people working in banks, offices and management firms. 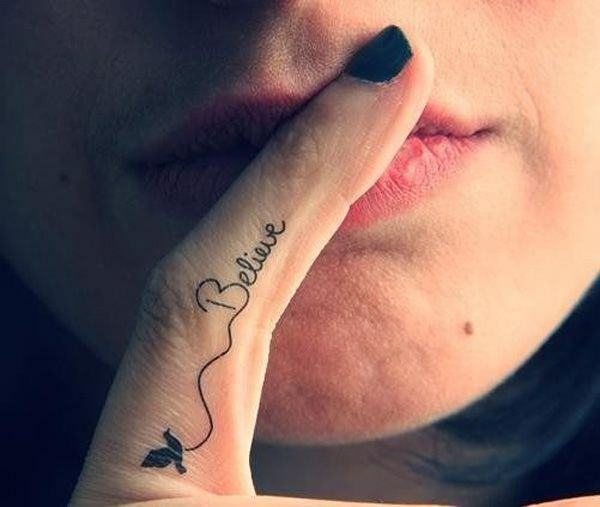 However, a finger tattoo makes it possible for you to make your wish for tattoo happen, and still have it remarkably subtle and hidden. 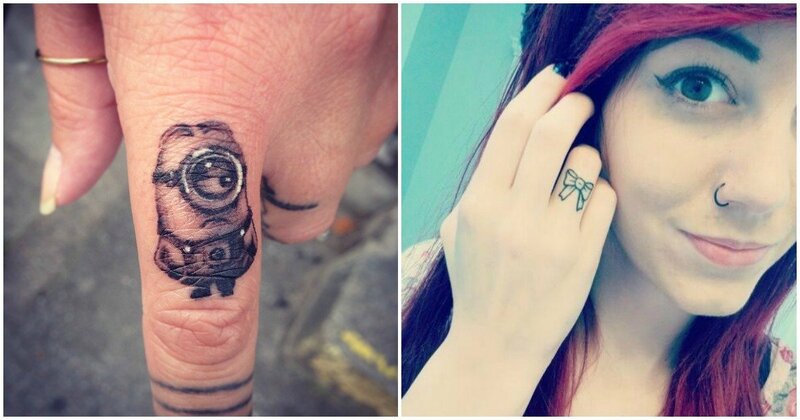 Let’s take a look at several ideas for finger tattoos. 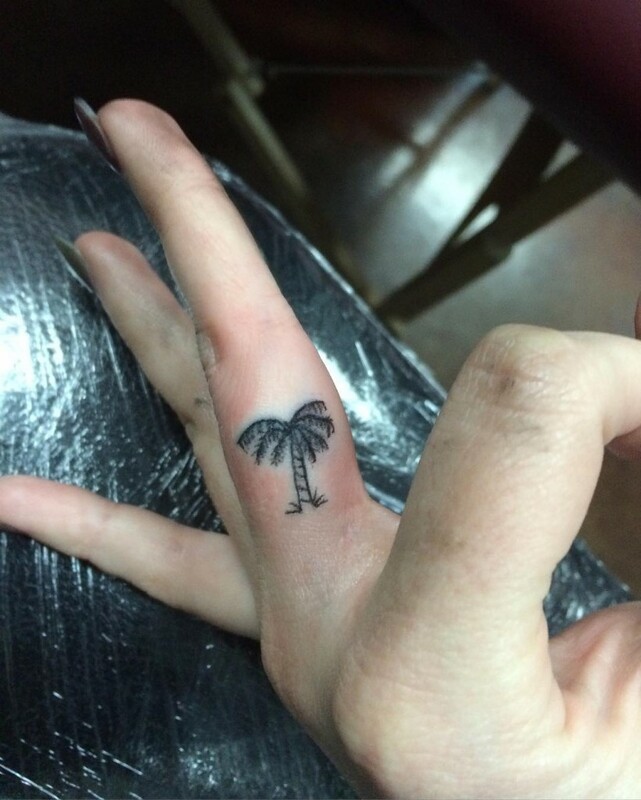 Immediately you think of summer days, beaches and sea, palm tree is a great tattoo for people that love more casual and loose lifestyle. 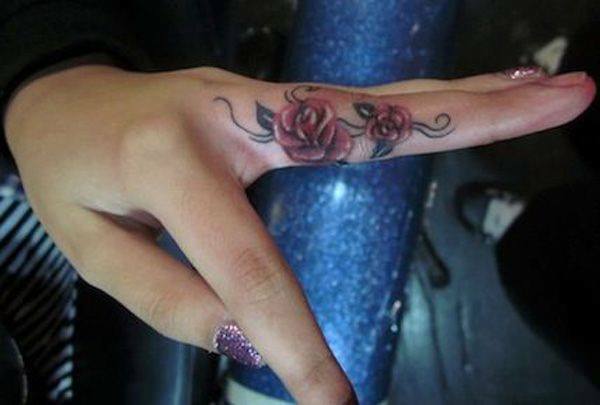 There are literally hundreds of flower designs you can think of for a finger tattoo. 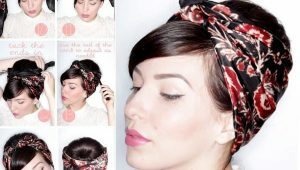 With a rose design like this one, it looks more like you are wearing a ring on your finger. 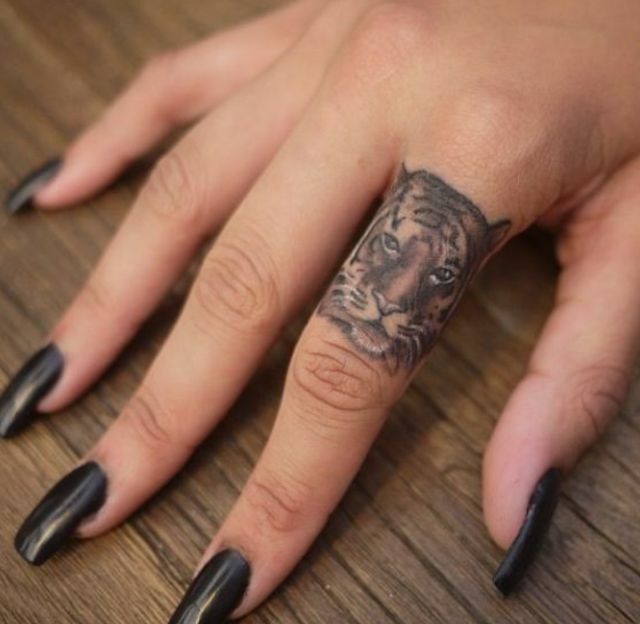 Fearless sophistication is the best term you can use to describe a person with a tiger tattoo on his/her finger. It really brings out the wild side out of you. The problem might be matching your outfit, since tigers are not some animals you can “wear” with classic and formal outfit. Well, this is not so subtle, is it? But this tattoo is a perfect example of what tattoos actually are. There are people who tattoo themselves for fashion and style, and then there are ones that want to send a message and express their own beliefs. 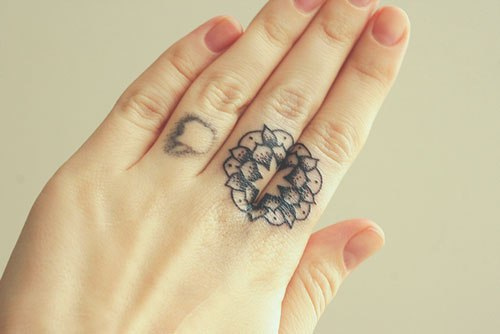 I must say, I love this tattoo. 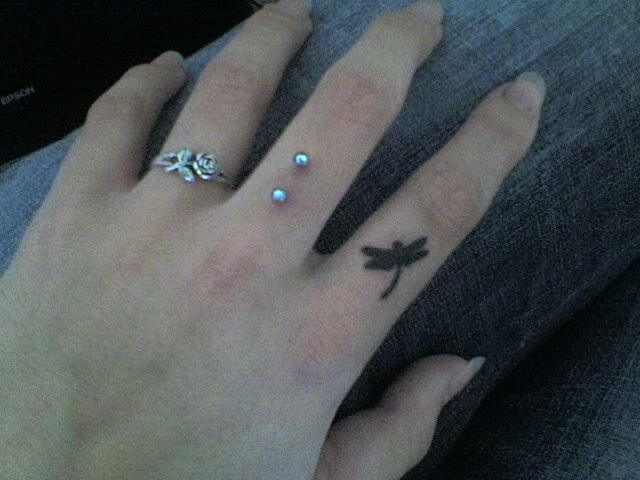 I first saw it on some pictures and clip art, but I never thought it would look so nice on actual fingers. It is the perfect way to bring out your romantic side. 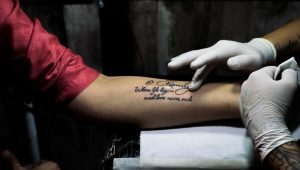 This is another tattoo that is more about the symbolism of the tattoo than the tattoo itself. 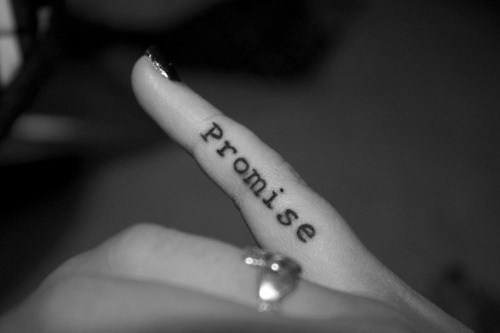 Pinky promise or pinky swear is a popular term used for binding. 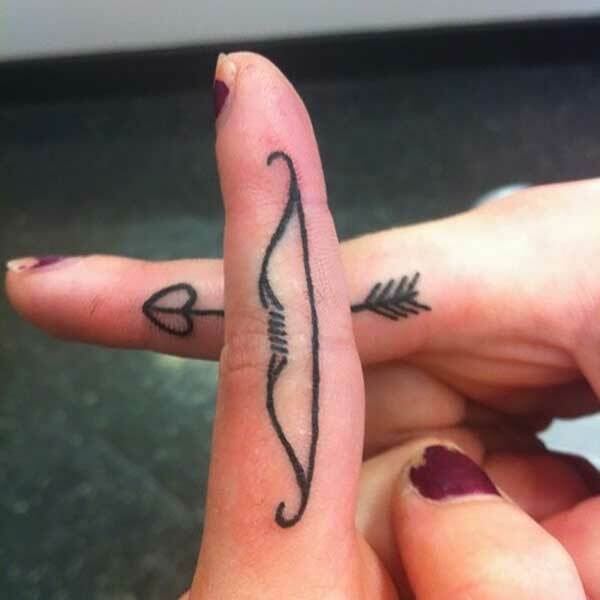 You can really see the creative side of a person by his or hers tattoos. As I said, there are people that actually think through and analyze their tattoos. The angel wings certainly fall into that category. 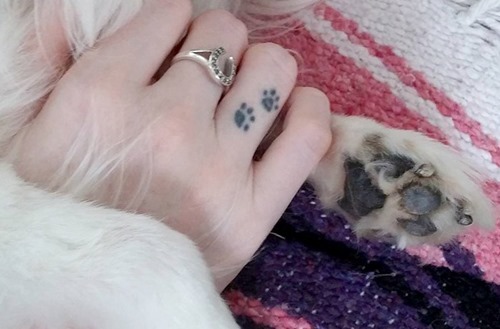 Paw prints were one of the most popular tattoos some five or six years ago. Back then, paw prints were reserved for your neck. Now, they make their way onto your fingers. If you would like to make your tattoo even more subtle than normal, use white ink. 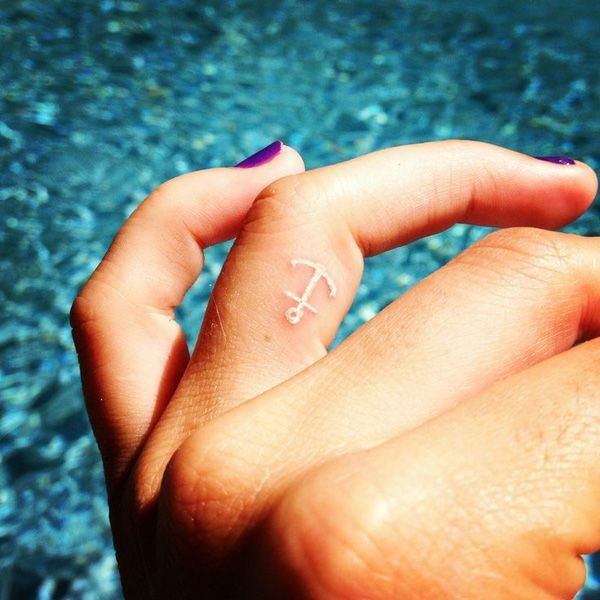 You can barely notice the white anchor here, but as I said, not all tattoos are made for noticing. Another symbolism tattoo, the best part is that you won’t notice it at first glance. 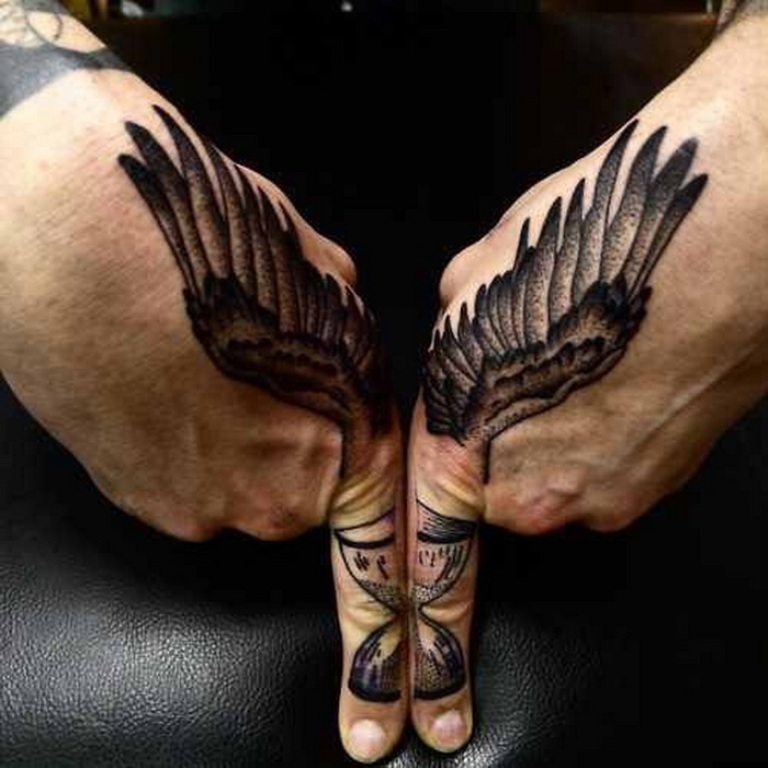 Since both hands need to be in sync for the tattoo to be recognized, most people will not notice the true origin of the tattoo. But you’ll know, and that is more than enough. All good things come in small packages — at least, that is the premise. 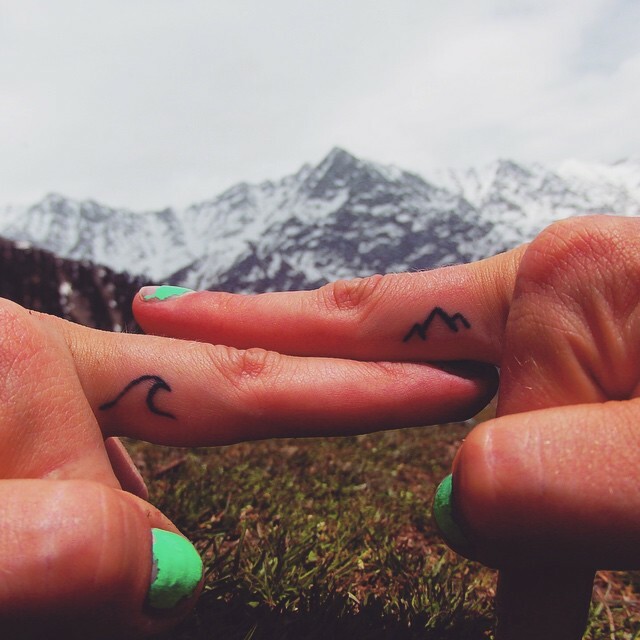 And when it comes to finger tattoos, they can be even smaller than you’d think, as evidenced by this small graphic of sea and mountains symbolizing freedom and adventurous spirit. The peacock feather is one of the most popular inspirations not only in the tattoo world, but also in the fashion industry and art world. The feather itself is so elegant, sophisticated and beautiful, and that is without mentioning of the symbolism behind the feather. 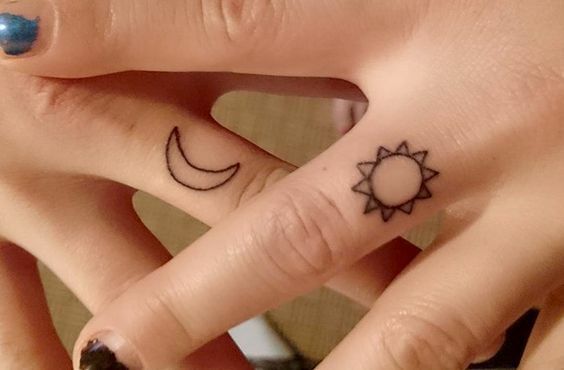 The sun and the moon, eternally connected in the cycle of life, now onto your fingers. There is no life without sun, and there is no life without the moon. Stories have been written and told with centuries for the connection between the sun and the moon, two symbols that you can find on multiple art masterpieces. Ah those Minions — who doesn’t love them? Children, adults and even my grandparents love minions. They are so cute, so delightful and so funny, you just can’t ignore them. 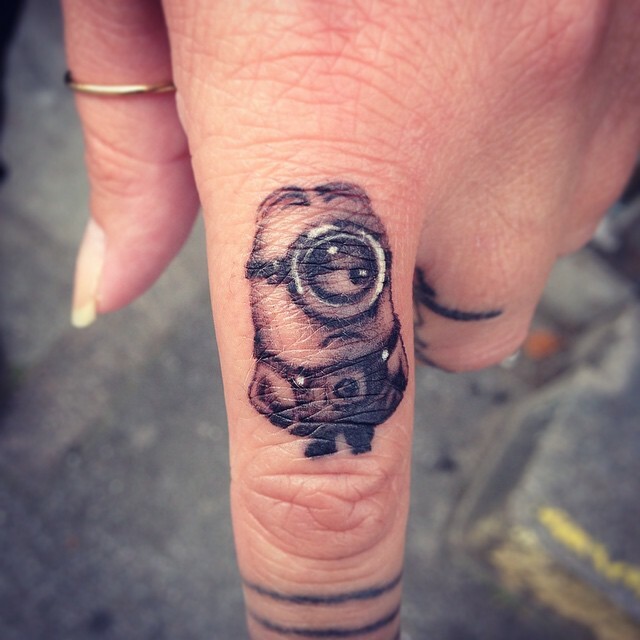 A tattoo is an excellent way to pay tribute to your favorite cartoon character. 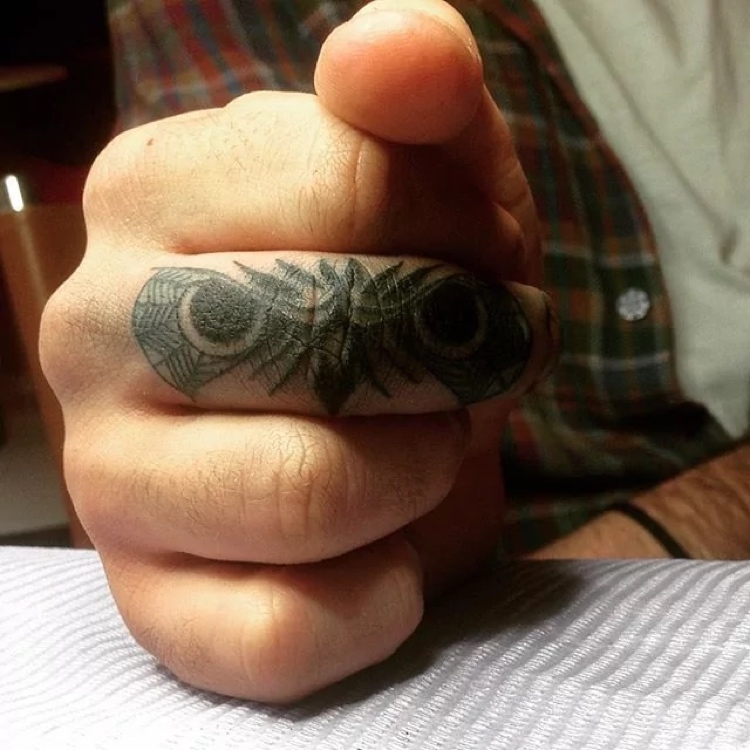 Owls, known for their vision in the dark, symbolize power to see things others take for granted. Owl eyes, or the owl-eyed man became popular thanks to the Great Gatsby. The owl eyes are the Western World version of the “All Seeing Eye,” or the Eye of Providence you see in freemasonry and masonry. “Cuteness overload” could easily be the title of the tattoo. 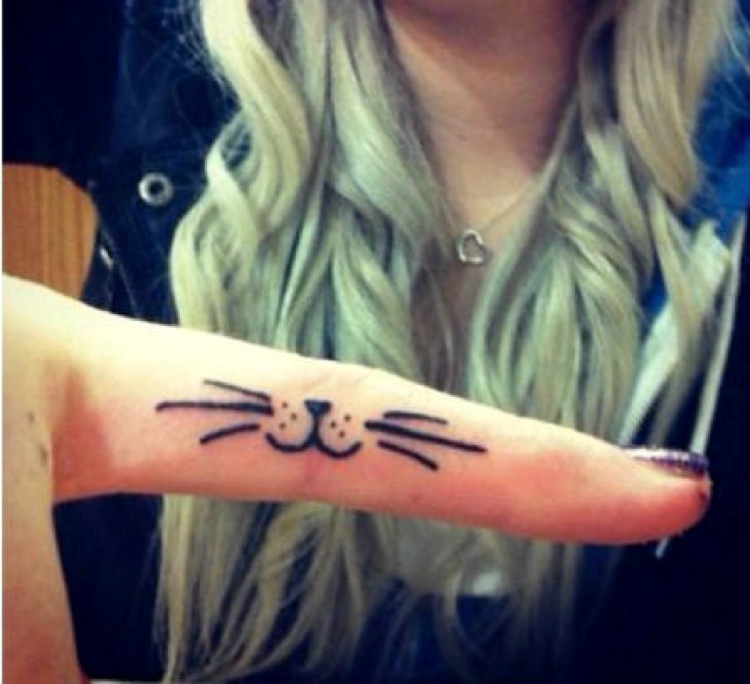 Cats pictures, videos and GIFs have taken over the social media lately, so why not cat whiskers as a tattoo? Time is ticking out, but your tattoo isn’t. 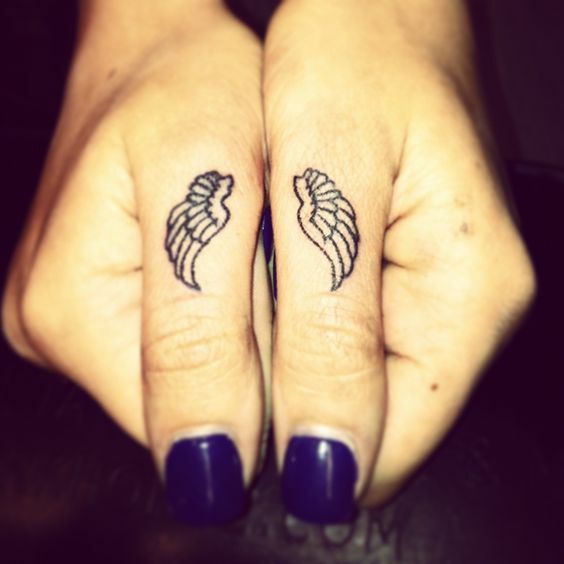 Symbolism is definitely most present in finger tattoos, making your fingers a great place to express your opinion and views on the world. 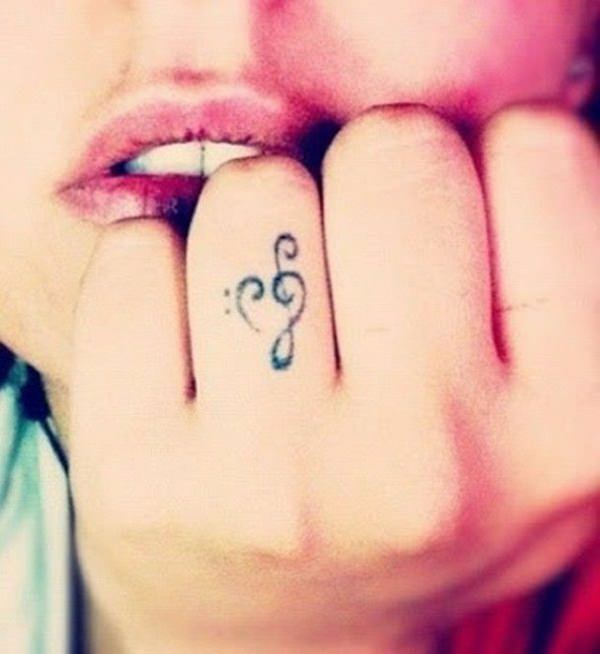 A perfect composition, a perfect melody, is what this tattoo expresses. With a music key that symbolizes the melody of life, this heart has so many symbols, it is hard to break them down. One can arguably say that the second part of the heart is a sad face, so why the sad face? 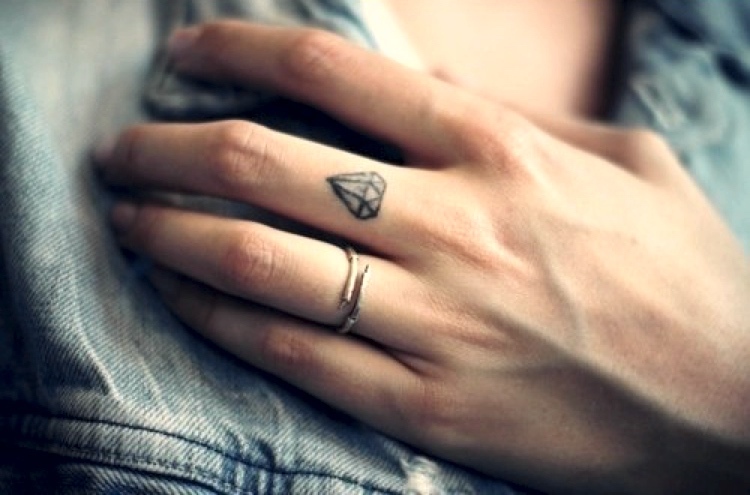 Instead of a diamond on your wedding ring, why not diamond tattoo on your finger? And when you say diamonds are forever, a tattoo really is forever. What better way to symbolize eternal love? In the Indian, or Hindu, religion, a mandala is a symbol for the universe. The circle represents the spiritual cycle of life. In the common symbolism, however, mandala has become a popular way to describe any diagram or geometric pattern. Anyhow, it is a nice touch to put a symbol on your finger that few know what it means actually. 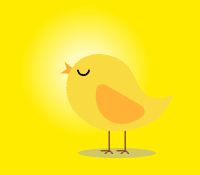 Here is an Irish symbol. 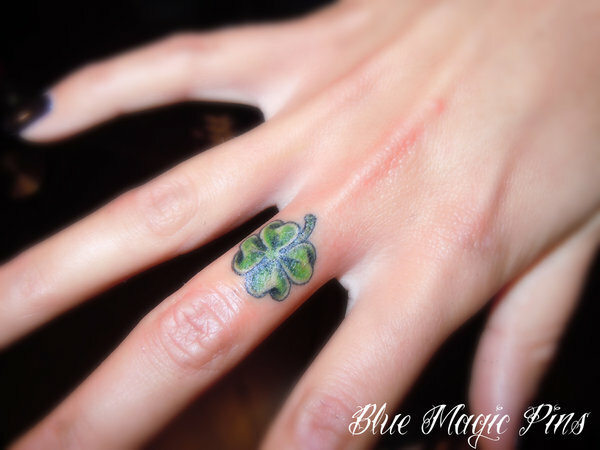 The lucky clover is something you see often on St. Patrick’s Day, and due to the popularization of the Irish holiday, the clover has become an international symbol for happiness and luck. 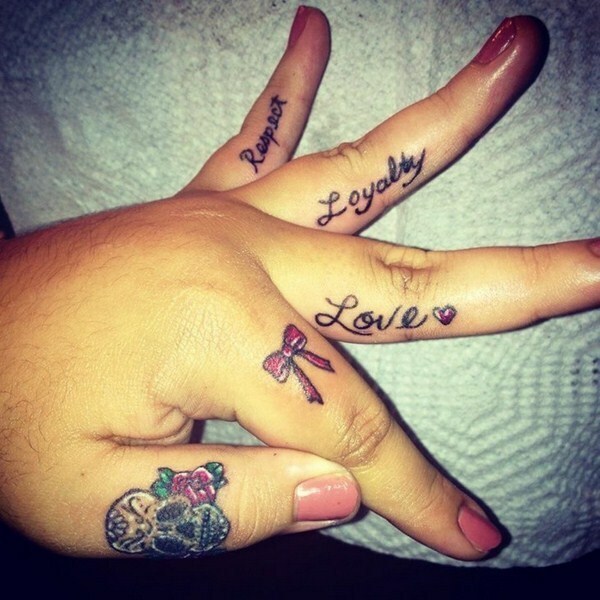 When you want to take things to another level, you can’t tattoo just one finger, you need to tattoo them all. And no matter how much you think every symbol and finger is different, you must pay attention to the whole, to the sum, and be careful that your fingers are in harmony. There are different priorities in life, and there are different things that are important to people. In this case, however, respect, loyalty and love are the three most important aspects in life. 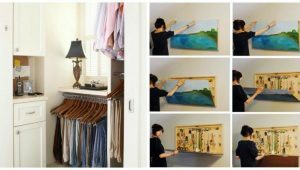 You can come up with your own; for example, family, friendship and trust. 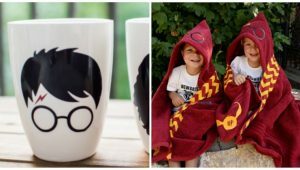 How can you make the “Shhh…” sign even more prominent? 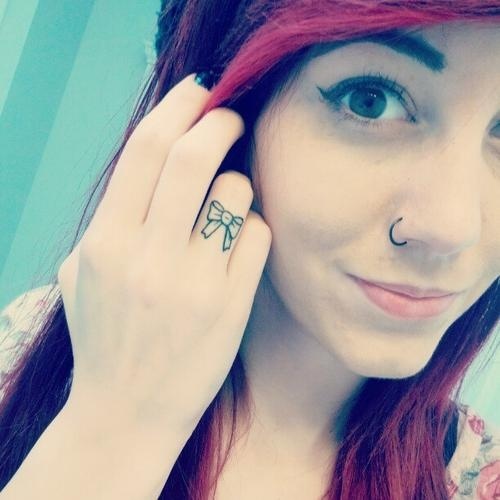 Well, by tattooing “Shhhh” on your finger. This way, any time you put your finger on your face to shush somebody, they will “get the picture”. There is a saying that the “darkest nights produce the brightest stars.” The reality is that stars cannot shine without darkness. 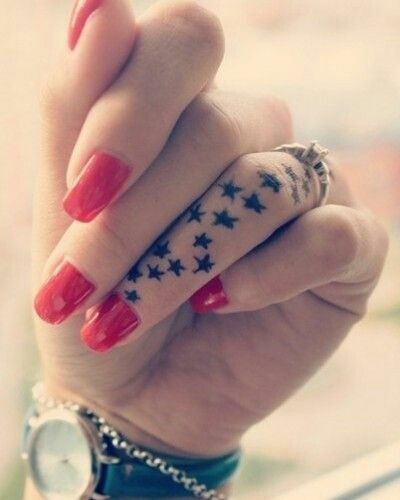 That being said, when you want to symbolize the darkness in your life, stars might be the best choice. Another cute and interesting tattoo, bows are good because they are timeless. 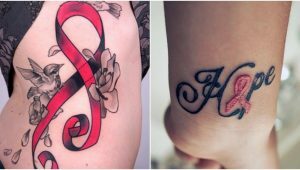 When doing a tattoo, you must pay attention to the symbol, because it will stay with you forever, and a bow is definitely something you’ll always want. Back to the cats of the world, we see a little different drawing here. But the symbolism is the same, cats are cute and they look cute on your finger. The drawings can vary, but the cuteness will stay forever. 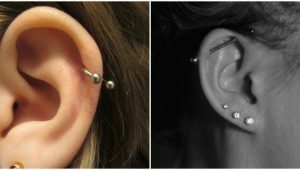 This is another interesting way to add more jewelry to your hand without actually buying jewelry. 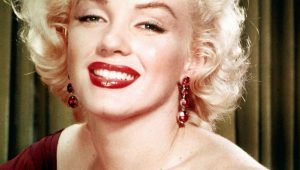 Same as with the engagement ring diamond on your finger, any gems can look good on you. Do you know a female who doesn’t love Hello Kitty? I thought so. The Japanese character has become extremely popular that both teenagers and old grannies love her. A single word on your finger can mean so many things, and as always, you get to choose the one that is most important for you. We had promise, and now we have believe. Some people never lose faith in what they believe, be it religion, love, their work, their ability to do something and so on. And they mark it on their finger. 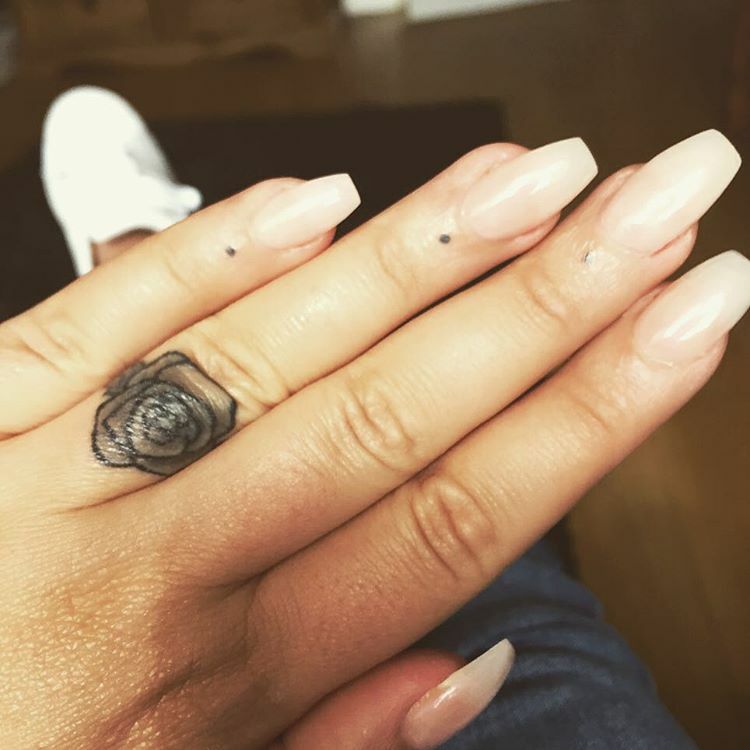 We already had one beautiful rose flower, but now you get to see how a whole rose looks on your finger. And it has color, too!